ReaSoft PDF Printer Server Edition is a proven solution for enabling reliable PDF creation by any number of users in a corporate network. It can be installed on a server for use over LAN, in Windows® Terminal Services and Citrix® Metaframe environments. The Server edition significantly facilitates setting up the printer for use in a network. What is more, it supports Windows Point and Print architecture (applicable to installing the printer for use over LAN). Basically, you only install the printer on a server machine, and all users connected to the network get all the features of ReaSoft PDF Printer Standard automatically (unless you decide to assign licenses manually). No 3rd party utilities are required. 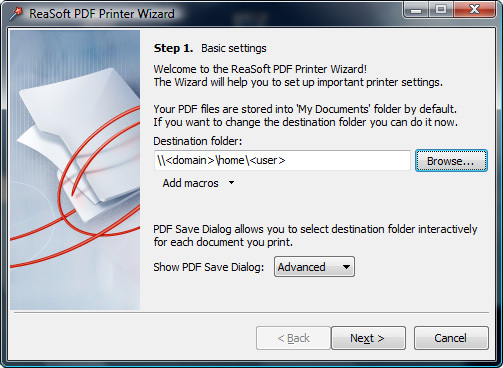 Upon installation, ReaSoft PDF Printer Wizard and ReaSoft PDF Printer Settings are added to the Start menu. You can use them any time for configuring the printer and for customizing the users' settings. To configure the printer for use in the network, you can use both ReaSoft PDF Printer Wizard and ReaSoft PDF Printer Settings. The Wizard is intended for quick configuration of the printer. 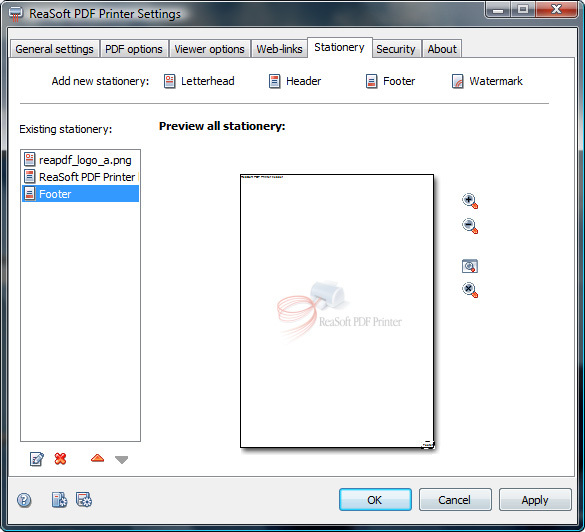 ReaSoft PDF Printer Settings is intended for more detailed configuration. The Wizard takes you through 3 essential steps that are identical for all editions (Lite / Standard / Server), but adds a new one (Step 3 in the Server edition) intended for taking care of users and licenses. Thus, configuring ReaSoft PDF Printer Server with the Wizard turns into a 4-step process, two of which should be given some attention here. The 1st step is slightly different: with the Server edition you can specify the destination location using special network and date/time macros, such as user, machine, domain, IP, date, time, date and time. Macros can be really helpful if you do not want to get lost in all those PDF files that the users print. Here you choose whether to assign available licenses to your users manually or automatically. At this step, you also manage the users' settings. For better convenience, you can arrange the users into groups. Here you specify the destination folder(s), choose whether to view PDFs after printing, enable the ability to send PDFs by e-mai, choose the type of PDF Save dialog, set paper size, and make your settings default for all users. These options allow to enable fonts embedding and change PDF compression. Use these options to control the way the output PDF documents will be opened in PDF viewers: you can set the initial view and page layout of PDFs, choose at which page to open the documents, etc..
You can enable automatic web links recognition, define how to detect them, etc. You can add your own reprinted stationary, such as letterheads, headers, footers and watermarks. Security options include protecting your PDF files with a user/owner passwords. You can also choose the encryption strength (40-bits or 128-bits), and assign digital rights to your documents. For better control over printing, you can examine the ReaSoft PDF Printer Server log file. The number of users allowed to use the printer is limited to no more than allowed by the purchased Server license. If the number of users exceeds the number of users allowed by the license, additional license(s) should be obtained. The control over licenses is taken by administrators. ReaSoft PDF Printer runs on a server, enabling users connected to a local network use it as a shared printer. Administrators take care of the users' settings, which leaves it up to users to only press the 'Print' button. If allowed by administrators, users can change just some of the basic settings, such as paper size, fonts, etc. The main difference between the shared printer on LAN and the printer installed for use in Windows® Terminal Services and Citrix® Metaframe environments is that the latter (even though it runs on a server) behaves as if it is installed locally. 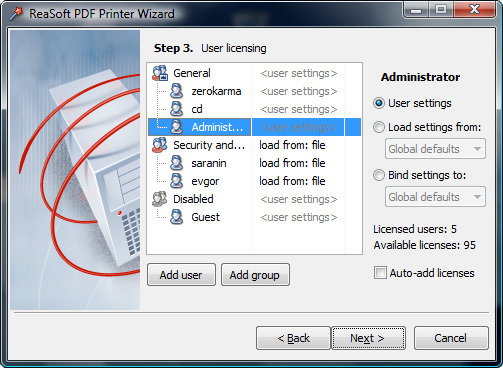 All users can access all features of ReaSoft PDF Printer and configure their own settings without any restrictions (unless the modification of settings is not allowed by administrators). Download ReaSoft PDF Printer SE and try it for FREE!